It's been snowing all weekend and I have always wanted to try to get a macro of some snowflakes. 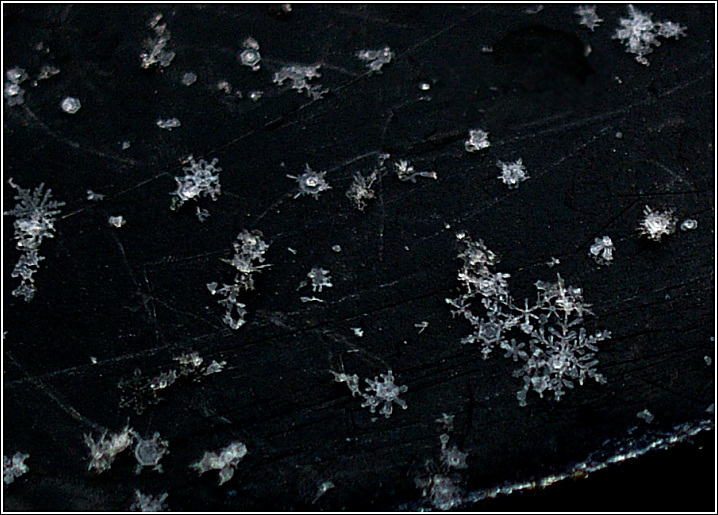 These snowflakes are only about 1/8 inch across, up to maybe 1/4 inch for the largest one. It will probably get killed in voting as I maxed it at 100% crop so it isn't as sharp as it could be but oh well, I like it. PP with PSPX includes clone out sensor spots, curves, brightness and contrast, resize and usm. Wilson Bentley would be glad to see someone following in his passion. If possible I think I would have cropped closer around the cluster in the lower right. Seems a bit dark for such a subject. It still has had to be some work to get this image. Oh wow - how did you capture this? I like this -- I would like to see the snowflakes stand out a bit more. Proudly hosted by Sargasso Networks. Current Server Time: 04/26/2019 01:41:40 AM EDT.